Montenegro invites all visitors to its stand, where some of the components of its represented companies Coperion K-Tron and Coperion are exhibited. There will be many innovations presented in this edition, including valves, metering devices and line controls. The gravimetric loss-in-weight feeder Coperion K-Tron K2-ML-D5-T35 QC, for instance, is present with a pneumatic feeder of the 2415 series, for automatic filling. New also the line controller Coperion K-Tron K-Vision in software version 2.1, connected to a KCM controller. Other components are: rotary valve Coperion ZXD 200 with rapid extraction of the rotor type FXS; rotary valve Coperion for healthcare applications ZZD100; pneumatic diverter Coperion WZK. 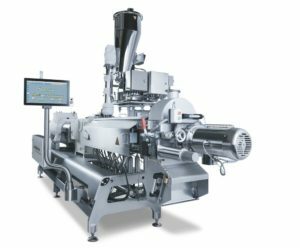 Interested parties may attend to a complete presentation of the Coperion Food Extrusion division, rich in images and examples of applications.